A group of us were looking at new early childhood product possibilities recently and we saw this large, colorful slinky. Everyone was so excited and thought it was so cool. A product developer said, "Yes, everyone thinks it is great. But what do you do with it?" That became the big question. 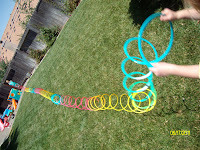 They gave me the slinky to try out with my grandchildren to see if we could think of activities to do with the slinky. This was a difficult assignment. Because the slinky is prone to knot and bend and really was too big to do the token 'walking down the stairs.' We did have fun shaking it up and down like a parachute, but beyond that there wasn't much to do with it. I certainly realized I couldn't write an activity guide to accompany the slinky. It was a lesson learned about how sometimes things are cute and attractive, but not very useful in building skills. I see early childhood products like that occasionally. Sometimes they're just a slinky. I ran a half-marathon yesterday and was suffering the last few miles. I had purchased running shoes which had been 'fitted by experts' that did not provide the support that I needed to run 13 miles. I broke my foot in a car accident in 1996 and that old injury came back yesterday at about mile 9 because the shoes I was wearing did not provide enough cushion to run that distance. I regularly considered stopping to walk, even though I knew that I was running a very fast race (for me). I tried running with my foot at a different angle, lengthening my stride, shortening my stride, running on a different part of my foot, etc., until I finally found a way to make the discomfort bearable. I finished the race well ahead of my usual running time. I was thinking about this yesterday, as I was trying to recover, and I thought of the number of classrooms I had been in this year that experienced discomfort, gave up and started to walk. I know that we have very challenging behavior issues today in our school classrooms. However, I do get frustrated when I see the teacher has 'given up' because 'nothing works.' It is my belief that a teacher should never 'give up' on helping a child achieve acceptable behavior in the classroom. The teacher needs to try difference angles, maybe lengthen or shorten the stride of what is happening. But, continuing to do the same unsuccessful intervention is fruitless and may lead to reinforcing the negative behavior. If I choose to run another race in the very same shoes I used yesterday, the same thing will occur and will probably eventually lead to an injury or weakness. Why do some teachers think that if they continue to use an intervention that does not work, it will eventually work (the big culprit here is 'time out')? My student teachers this last year will tell you that I continually reminded them that they might have to try 20 intervention ideas before they find something that works for a child that is disruptive. When a teachers tells me that 'nothing works,' I tend to think that she just doesn't want the child to comply bad enough. If the teacher did, she would continually be trying new things or looking for additional resources. I'm glad I persevered enough and found a way to make it to the finish line yesterday. It wasn't easy, but at the finish line it certainly was rewarding. Helping a child curtail disruptive behavior isn't easy, but it can provide long-lasting rewards.